MB5X pendulous hanging grinding mill represents the most advanced grinding processing technology at present, and its application of patent technology of brand-new structural design makes the equipment’s operation and maintenance cost much lower, environmental protection performance more excellent and discharging quality much superior, thus it is the optimum choice for upgrading and updating. The limestone, calcite, marble, barite, feldspar, talc, bauxite, phosphate ore, iron oxide red, dolomite, granite, bituminous coal, anthracite, lignite, kaolin, bentonite and other non-combustible and non-explosive brittle mineral products whose Moh’s hardness are below Grade 7 and water content below 6% could all be ground. Grinding roller device of MB5X pendulous hanging grinding mill adopts thin oil lubrication, which is a technology initiated domestically, and it is maintenance-free and easy to operate. Thin oil lubrication is of oil bath lubrication, which is more convenient than grease lubrication since no frequent oil-adding, and it is of lower maintenance cost as well. Special temperature detecting device is set in the place of main-shaft bearing, which could make real-time detection of operating condition of the bearing, is convenient for discovering bearing malfunctions timely and could ensure reliability of operation of equipment. 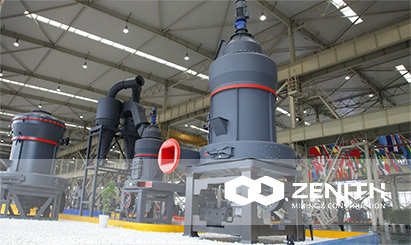 MB5X pendulous hanging grinding mill applies special groove shovel flow channel, which could effectively concentrate the materials, and make it easier for the shovel blade to convey the materials to the grinding area, thus improving the grinding efficiency.